Western know-how comes in handy for repurposing unneeded materials into themed decor. Tin cans, scrap barn wood and feed sacks supply the basics for building western-themed decor for in and around your home. Even inexperienced or first-time crafters can accomplish most of these projects. Turn clean feed sacks into cafe curtains by attaching them to curtain ring clips on a cafe rod for a window over the kitchen sink. Select feed sacks featuring text or images of cattle, or embellish the material yourself with stamps and fabric paints. Cut the fabric to the size you desire for your windows, using leftover fabric to craft hand towels, place mats or curtain tiebacks. Coffee sacks featuring cowboys or horses may be used in place of feed sacks for burlap-based decor. Frame visually interesting coffee or feed sacks for simple wall art for the kitchen, living room or dining room. Turn cleaned, plain tin cans into Western candle lanterns by punching designs in them with a hammer and nail. Freeze water in the can to prevent it from denting as you punch the holes, then draw a design template on paper using a series of dots for your design: a howling wolf, a teepee, a horse or a cowboy boot with spur, for instance. Tape the paper to the can, then punch the holes through the paper and can into the ice. Make a different design on the other side of the can, if desired, to get twice the decorative value from the same can. Run the can under hot water to release the chunk of ice, then dry the can. Spray paint the can a color to match your indoor or outdoor color scheme, then add a votive candle in a glass candleholder once the paint dries. Create covers for solar landscaping lights in the same fashion, drilling or cutting a hole out of the bottom of the can to slide it over the light stake, leaving the solar panel exposed. Spray paint only in a well-ventilated area to avoid breathing in toxic paint fumes. Turn barn boards, sanded a bit to remove loose paint or debris, into decor and accessories for around the house. Attach a board or two, side by side, to wrought iron shelf brackets to create a wall shelf, attaching the shelf to studs or with wall anchors. Hammer a series of barn boards together, each a bit different than the next, using scrap wood on the back to hold them together. Paint a western design on the front over the old wood, such as a bucking bronco or a branding iron, or leave the piece as-is for an upcycled item of Western wall art. 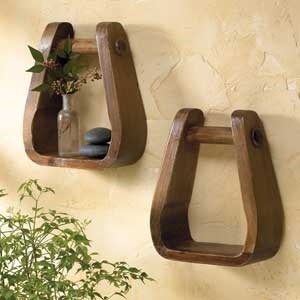 Secure the wood art piece to the wall over studs, or use wall anchors. A series of wide barn boards becomes a sofa table, adding old wooden fence-post spindles as legs, or create a bench using one wide board for the seat and two short, wide boards for the legs, each with a notch cut out of the bottom to form legs or feet for the bench. Turn existing beige, white or chocolate brown pillows into cowboy-worthy creations by painting or stamping them with Western-themed designs such as a cowboy boot, cowboy hat or horseshoe. Use fabric paints to create the design after tracing a cutout paper image first with a fabric pen, or use craft stamps. Create your own stamp by carving a design into a sheet of craft foam or shipping foam. Make your own pillow covers using grain or feed sacks, stitching them into the desired size. Embellish homemade or store-bought pillows with rawhide or suede laces, stitching the thick shoelace-like material around the perimeter of each pillow with an upholstery needle. Leather or suede fringe added to the pillows gives them an instant western makeover.